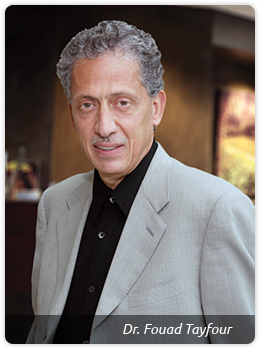 Dr. Fouad Tayfour is considered by his peers to be a pioneer in the field of modern cataract surgery. In 1991, Dr. Tayfour became the first surgeon in Canada to perform cataract surgery under topical anesthesia and in the same year, performed the first clear corneal incision. Over the last 14 years, Dr. Tayfour’s experience and commitment has resulted in superior results for his patients enabling him to build the largest cataract practice in Canada with close to 2,500 procedures performed each year. . In fact to date, he has performed over 30,000 cataract procedures and has kept informed of cutting edge technology in the area of implants for modern cataract surgery. Choosing Dr. Tayfour to perform your cataract surgery will provide you with the assurance of receiving the most advanced, most efficient and safest technique during the procedure. In addition to Dr. Tayfour, a knowledgeable surgeon with expertise in the field of vision care is a friendly and experienced staff maintaining a busy but very accessible office for their valued patients.